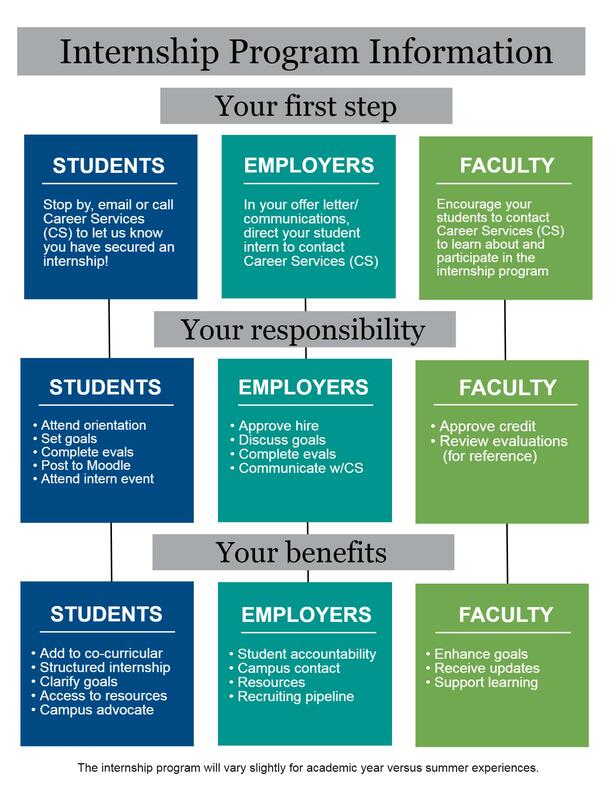 Career Services encourages all student interns to participate in our Internship Program to best support their experience. Students can hold internships any time during the academic year as well as over the summer. As part of the Internship Program students are celebrated and given a chance to share their experience at an annual Major, Intern and Research Symposium each fall. Below is a brief overview of how to enroll in the program, what the program will entail and its benefits. NOTE: Summer Internship Orientation dates can be found in LUworks. Those participating during the academic year can meet with Career Services individually to enroll in the program. Each student's internship search will be different, so we would love the opportunity to discuss your search with you. Everyone is at a unique place in their career development and there may be other questions to answer or steps to take prior to the internship search. For this reason we encourage you to take one of the two action steps listed above so we can help to assess how we can best support you and provide resources for your individualized internship search. Students often complete up to 2-3 internships during their career at Lawrence. Some students consider pursuing internships as early as the summer of their freshman year, but there is no "right" time. Internship requirements and qualifications vary- some will be a great fit for students simply looking to explore a field while others may require more advanced previous experience or skills. Internship deadlines vary based on the field and company/organization, however more and more internship programs are starting to recruit and accept applications as early as fall term for the following summer. Large corporations and those with competitive programs often recruit in the fall, whereas nonprofits, smaller organizations or those with few interns may recruit into the winter and spring for summer interns. It is recommended that students begin searching early! develop a plan with a faculty supervisor, usually including readings and a substantive paper, project or presentation in connection with the experiential learning provided by the internship. register the same way they would register for directed study, tutorials, or independent study. Students can review the course catalog to determine if a particular major has an existing internship course credit. Students interested in earning academic credit from departments who do not have a listed internship course will need to submit a request for academic internship to the Instruction Committee. Requests are due by week 6 of the term BEFORE the one in which you would like to complete the internship. Students completing internships during the summer who would like to receive academic credit will need to plan ahead with their faculty supervisor to receive the credit in the Fall Term following their internship experience. Arrangements and discussions with your faculty supervisor should be made prior to the internship starting. It is not required that students receive academic credit for internships. Students receiving academic credit are also encouraged to participate in the Internship Program. Those students requiring Curricular Practical Training (CPT) or other work authorization should direct questions to the Director of International Student Services. Students with CPT should participate in the internship program as well, but must also report their internship via International Student Services. In collaboration with other campus offices, we offer the Summer Experiential Learning Grant, to provide funding for internships. Applications are available winter term and are due spring term. Thanks to the generosity of our alumni who have funded the Lawrence Scholars in Business (LSB) program, each year students can apply for the Lawrence Scholars in Business Award. The LSB Award, up to a maximum of $5,000, helps students cover expenses related to summer internships. Eligibility criteria and more information about the application process can be found here as is posted to LUworks each Fall. Career Services does occasionally have other funds to support students' career exploration, including internships. Students can inquire with the office about funding available, and if funds exists will be provided an application to apply for consideration. Housing is not often offered by an internship site. Students should consider housing costs and options during their search. Students interning in the Appleton area over the summer are eligible to live on campus. Summer housing meetings are held winter term and students can receive applications for summer housing from Campus Life. A staff member from Career Services can sign off on campus housing once a student has registered for the internship program and confirmed they will be interning at least 10 hours/week. If you are looking to hire a Lawrentian please feel free to contact our office . We can help you to learn more about posting opportunities and recruiting students, as well as our internship program and how we can support you as a supervisor.